Louis Comfort Tiffany introduced his Favrile art glass in the mid-1890s. It was in production through 1933. It not only won awards but inspired other glass companies like Loetz and Quezal to make their own beautiful iridescent glass with a similar look. But, as you might suspect, not every piece of glass marked Tiffany was actually made by this top-shelf company. Since the hand inscribed marks varied greatly from piece to piece and decade to decade, signatures can easily be faked. There are indeed unscrupulous sellers who have taken unsigned antique glass in similar styles to those Tiffany made and marked them with a fake signature. Studying the colors and styles of genuine Tiffany glass, along with examining authentic Tiffany marks, are excellent ways to learn to recognize authentic pieces. The more you study the nuances, the easier it will become. This mark was photographed on an original Tiffany Favrile bowl. There is also a partial paper label present in the center of the polished pontil mark. Paper labels have been reproduced and added to some non-Tiffany wares, so take care to evaluate an entire piece based on the color, style and any other marks present when authenticating this type of glass. Another version of the L.C. Tiffany Favrile mark as seen on a footed pedestal bowl. The lettering can vary from slightly from mark to mark, as exhibited here in comparison to the similarly worded mark shown above. Found etched into the bottom of a beautiful white and blue hat-shaped bowl made in the late 1890s, this authentic signature spells out Louis C. Tiffany. Remember, this type of etching can be faked, so it is important to look for other signs that the glass you are viewing is authentic Tiffany Favrile glass. This mark features the L.C.T. 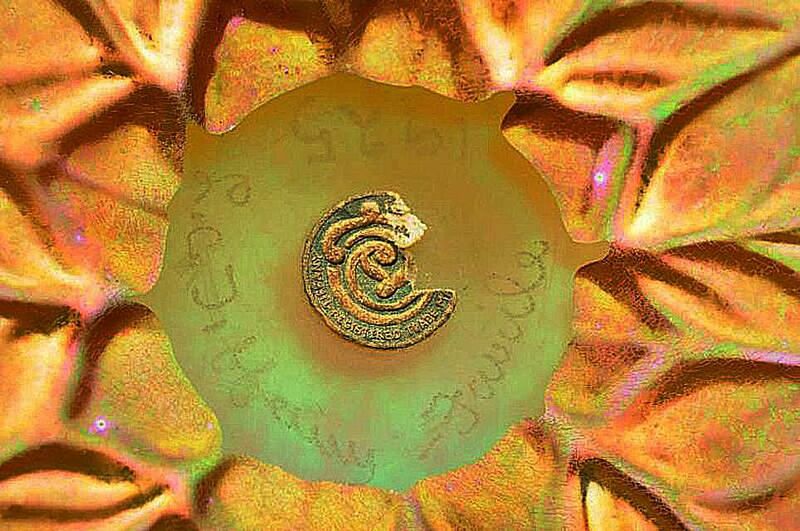 initials for Louis Comfort Tiffany along with the word Favrile etched into the bottom of a small iridescent bowl dating from the late 1890s to around 1900. Even though the Favrile designation in this mark is a bit shaky, that is not an indicator that this isn't a genuine piece of Tiffany glass. This mark, specifically the L.C.T., has been faked many times by those trying to fool unsuspecting buyers into thinking another type of iridescent glass is actually Tiffany. It is wise to examine the piece closely in all aspects before making a purchase. Another variation of the L.C.T. mark, which stands for Louis Comfort Tiffany, found on a gold and pink iridescent vase. In this instance, the mark was found on a genuine piece of Tiffany Favrile glass although the word Favrile is not present in the mark. This exhibits that the absence of the word Favrile is not an indicator that a piece is not authentic Tiffany glass. In 1920, Tiffany's glass making studios became Louis C. Tiffany Furnaces, Inc. This mark is found on a piece with a more modern look in comparison to older Art Nouveau designs, which corresponds with the time frame of the company's name change. The numbers included in the mark do not indicate a model or style number, so always keep that in mind if a seller says otherwise. Have You Heard of Durand Art Glass? Is Your Roseville a Reproduction or Is It Authentic? How Valuable Is Your Tiffany Reproduction Lamp? What is a Jack in the Pulpit Vase?